Rowing machine workouts are a superb way to lose weight and get those pounds down. This can be done either in the comfort of your own home, or at a local gym. If you can afford to purchase a good quality rowing machine there is no reason you cannot enjoy the benefits of rowing from the comfort of your own home. Rowing machines come in many shapes and sizes and can be different in feel and performance. An ERG machine or a concept 2 rowing machine is a perfect rower for those who are keen on rowing to lose weight, but are not interested in joining a gym. However just finding the right machine can be a challenge. Looking on either ebay or Amazon should help you find a good quality machine. I would recommend a concept2 as they are by far the most reliable. If possible, try to buy the best quality rowing machine you can afford. Cheap rowing machines give a no feel when you use them, and you will soon get bored with them. They normally get used a dozen times before they end up in the cellar or garage. There are many forms of exercise you can do to lose weight. From the list above you have an endless choice of quality exercises to improve the cardiovascular system by working out. By working out correctly you will burn calories. For every calorie you burn you are helping towards a goal of dropping your weight. The best way to monitor this is to keep a logbook, or if you are lucky enough to have a decent model rowing machine with a PM3 or PM4 monitor, log every meter you row online against fellow competitors. By being able to log your project online you find that this alone is excellent motivation for you to train. Training against other competitors helps to motivate, and will keep you coming back for more. Before you know it 3 or 4 weeks will have passed and your will feel better from your rowing efforts. Not everyone has the money available for gym membership these days, so if you have the funds available, having a rowing machine at home is a great solution. Any weight loss will not come easy unless you show determination and watch what you eat. It would be pointless to row 5000 meters and then find that you have a hunger pang and need to fill it with a large Kentucky or a pizza. Diet is as important as the training if you want to lose calories. To be successful in our goal we have to look at what we want to achieve realistically. Just by training alone we can achieve what we want and burn calories. But depending on how many calories you consume compared to how many calories you burn in a day may show you that you have not done enough. That is why it is important to check what we eat each day. You will soon learn how to keep the calories under what we burn. Carbohydrates, protein, fat, water, food, meals, all come together here. By counting the amount of carbs we have in our diet and making a note when we start our rowing project we will soon be able to learn exactly what is 500 grams of pasta, or what foods contain to much fat, or how much protein a tin of tuna fish contains. Once we have mastered this we can put together some excellent meals that will count towards the goal. You can still eat your chocolate, and biscuits, just make sure you note how many calories and fat each contains, and add it to your daily intake, to give you the time you need to workout to burn the calories. Before you train, consider a good quality meal you could make for later that contains little junk, and has a good amount of energy and nutrition built into it. Any form of pasta meal would be ideal, or a rice meal. You need food that is slow burning and good for the diet. The ideal way of eating is five to six meals a day. If you are a beginner and have not done a great deal of cardio efforts for some time, make sure you consult your doctor before starting your fitness training. Your health is very important, and your heart may not be ready for heavy physical exercise straight off the bat. A bmi check, and a check of your weight is always recommended before you begin. This is also a great motivator if you can actually see that you are overweight. If you have purchased a rowing machine and have set it up correctly, you will now be ready to use it. By setting it up for your frame you should feel comfortable when you use it. If you are thinking of doing over 20 minutes on your machine, make sure you have a drink close by. By putting together a weekly training package you will monitor what rowing training you are doing and keep a solid record of your work. This will enable you to check your progress and see how you are improving. When first starting out with a rowing to lose weight plan, start slowly. Do not do too much when you first begin. By beginning slowly you will allow your body clock time to adjust to this new feature. Rowing is an aerobic exercise that will test your heart and lungs. If you have done no form of rowing activities before or are just beginning, you will feel the body pulling into shape. Make sure you keep your back straight and allow the arms and legs to do the pulling and pushing. Your chest should be expanded and your breathing controlled. You will feel the arm and leg muscles working, along with the lungs and your cardio system. Watch the monitor and check your rowing pace for what the machine shows as your row rate per 500 meters. An above average row is around 500 meters in 2 minutes. If you are overweight or just starting out, you will be lucky to match this. For beginners who are trying to lose weight, I would start at around 2.30 minutes for 500 meters. This should be a nice steady pace you can keep going for a good 20 minutes. try to keep your workouts in a steady routine for the first few weeks until you build up a steady program and feel confident on the rower. A chest belt from Garmin or Polar is worth its weight in gold if you are taking your rowing seriously. The last thing you want is to be in the red when you start off. By going off to quickly you can be in the wrong fat zone and doing yourself more harm than good. As you progress and your fitness improves, your strength will improve almost weekly. As you spend more time on the rower your heart and lungs won’t feel the pain as quickly as they first did. Your grip on the bars will improve and you will try different techniques and different workouts. When you feel ready, go online and look for challenges that will motivate you. With the concept 2 rower there are thousands of people online each and everyday worldwide looking for a challenge. Look at Facebook for rowing projects and join one. This can also give you motivation. 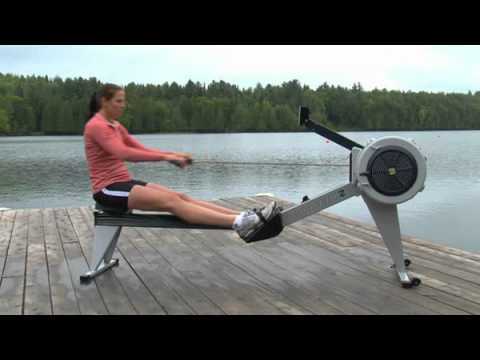 If you are looking to buy a rowing machine, I would strongly recommend the Concept 2 Rower. It is by far the best on the market. It can be bought online from Amazon. It is slightly more expensive than one bought from a large supermarket or a catalogue, but the benefits are huge. You would also get a good amount of your cash back at a later date if you sell it, unlike the catalogue ones which end up at the back of your garage as no one wants them second hand. A lot of rowing machines end up in the spare room stuck against a wall because the owner found it too hard, or the machine was not good enough. Try to check out the rowing machine before you buy one. That way you should have no excuses when it comes to putting your rowing to lose weight project together. Rowing is great for losing weight. However, like all things in life you need to be serious about it. It is not the easiest of sports and anyone considers rowing should try before they buy. For all round body fitness though, rowing is hard to beat as you are using most of your major muscles at any one time. Not only will you burn fat, you will also increase your physical condition, and help towards a good physical shape. Rowing is a good all round sport and well worth considering for anyone serious about burning fat. I have a great interest in sports and keeping fit. I am now over 50 and have dropped from 87 kilos to 80 kilos in less than 8 months. That is 1 (just 1) kilo a month. If you are interested more in rowing look at Rowing Machine Reviews for Rowing Machine advice. Rowing Workout 1: HIIT Sprints (30/30r in Concept 2 menu) If you’re short on time, these high-intensity intervals will give you a quick sweat fix.